If you haven’t made your way to the 60 Painters exhibition at the Humber Arts and Media Studios, you should take the time to make the trek. The exhibition aims to show a comprehensive overview of contemporary Canadian painting by both emerging and established artists. At times the definition of “painting” seems a bit loose with the presence of mixed media and sculpture works, but it definitely succeeds in presenting a broad range of current Canadian talent. Toronto painting is well represented, with some fantastic pieces by artists I have written about in the past including Tristram Lansdowne, Dorian FitzGerald and Bogdan Luca. The show offers a convenient opportunity to see work from elsewhere in Canada also. Below are some highlights. 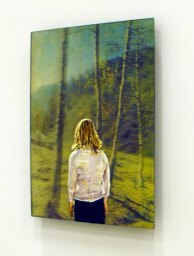 From Douglas Udell Gallery in Edmonton and Vancouver comes Natalka Husar’s eerie portrait The background that follows you. It’s painted on vintage Soviet lenticular (that kind of picture covered in a ridged plastic that moves when you shift your viewpoint). The sharp realism of the figure against a comparatively stark natural background prevents the image from reaching novelty proportion. 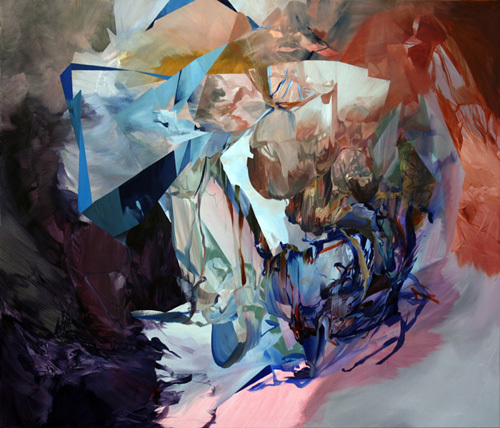 In Melanie Authier’s large acrylic work, Scavenger, the viewer’s perspective is prompted to constantly shift to make sense of the intense movement and abstract materialism of the piece. 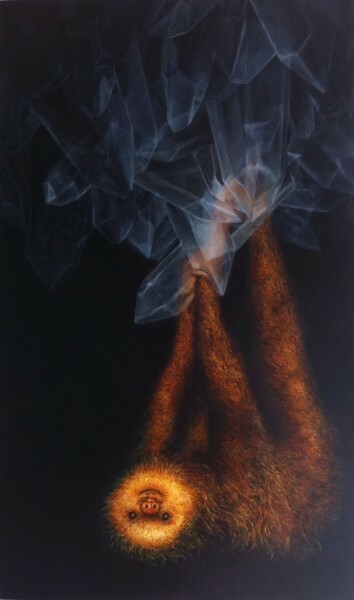 Martin Golland’s oil painting, Perch, offers the viewer a similar kind of surreal abstract material frenzy. For some reason, Nicole Vogelzang’s delightfully realistic Sloth hangs from a cluster of ghostly crystals. 60 Painters runs until June 19, 2012 at the Humber Arts and Media Centre in Etobicoke. 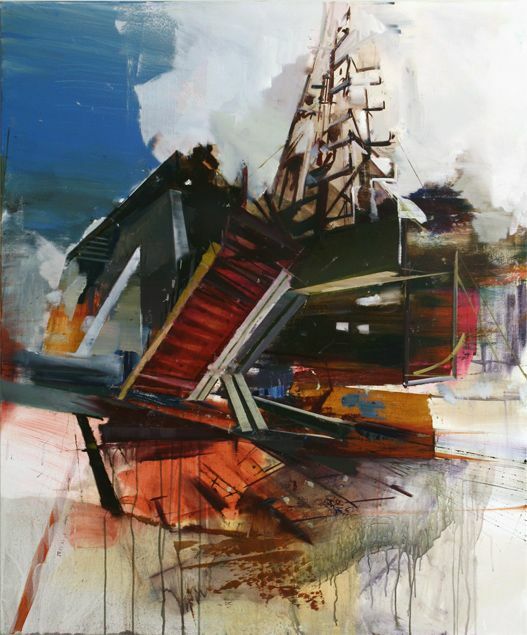 Header image from Bogdan Luca‘s painting The Crossing.